This list is used to be updated monthly. The next update will be when I can find the time. Hint:- Click on a column heading to sort the list differently. ** Please see about the index for more information. 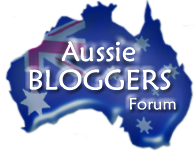 This list of top Australian blogs was compiled by Meg Tsiamis, who maintains Dipping into the Blogpond and co-founded dLook and Aussie Bloggers. This information is protected by the Copyright Act 1968. It may not be reproduced without consent. Ok, here’s my idea or really just the application of an existing idea. This post refers to OPML feed grazing and then SLE feeds.